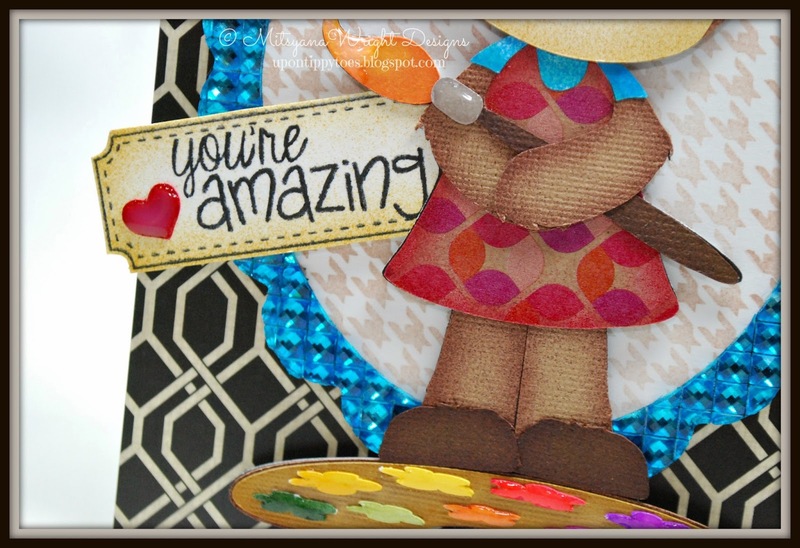 Up On Tippy Toes: You're Amazing!! Welcome back crafty friends!! I'm on card making overload!! And, I'm back, yet again, with another paper pieced and ebrushed card! 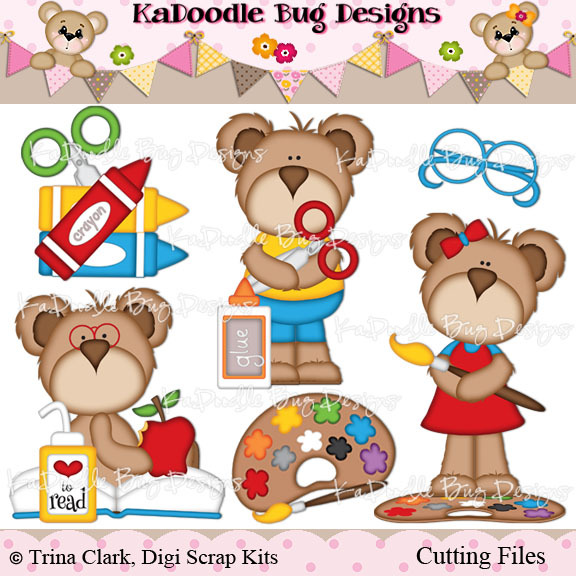 This cute little bear is from KaDoodle Bug Designs and is from the School Teddies file. ERMERGERD!! How stinkin' cute are they?! I'll tell ya... "BEARY" cute!! Pun totally intended... Sorry, just couldn't help myself!! 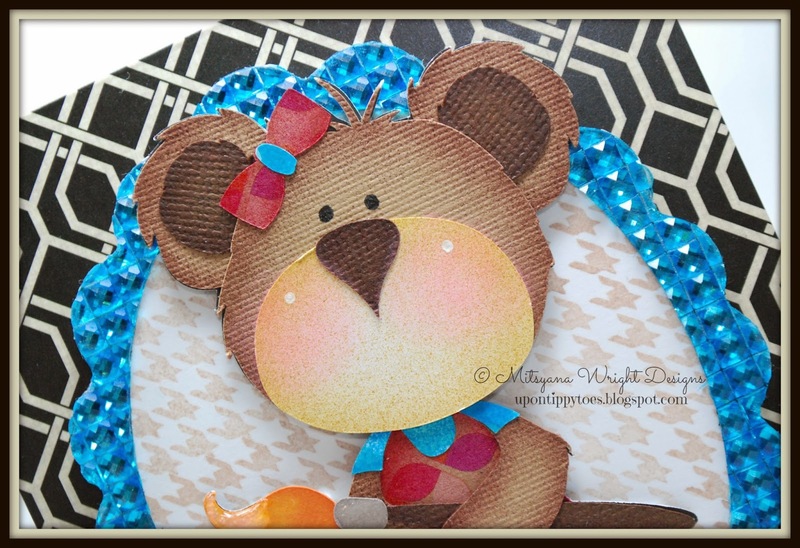 I cut out my teddy using my Sizzix eclips machine with ecal software. Once all the pieces were cut out, and before I assembled the pieces, I airbrushed them using my Sharpie markers and eBrush machine. If you follow my blog you'll probably recognize the blinged out frame. I just had to make another one of these gleaming bits of awesomeness! !I am so glad DCWV makes whole sheets of BLING (Adhesive Jeweled Sheets) because I just ran another piece through my Big Shot with my Sizzix Scalloped Oval Frame die*(retired), then gave it a quick spray with my ebrush, and presto a custom rhinestone frame! *Important side note: It's important when cutting you jewel sheets that you use a steel rule die and not a sizzlet or wafer type die. The blades in the thinner dies just aren't deep enough to cut through the gems. Also, when cutting with steel rule dies, cut with the paper side to the blade. As we know the paper shifts slightly while rolling through the machine and the blades may damage the the rhinestones in the process, so always face your bling away from the cutting blades. 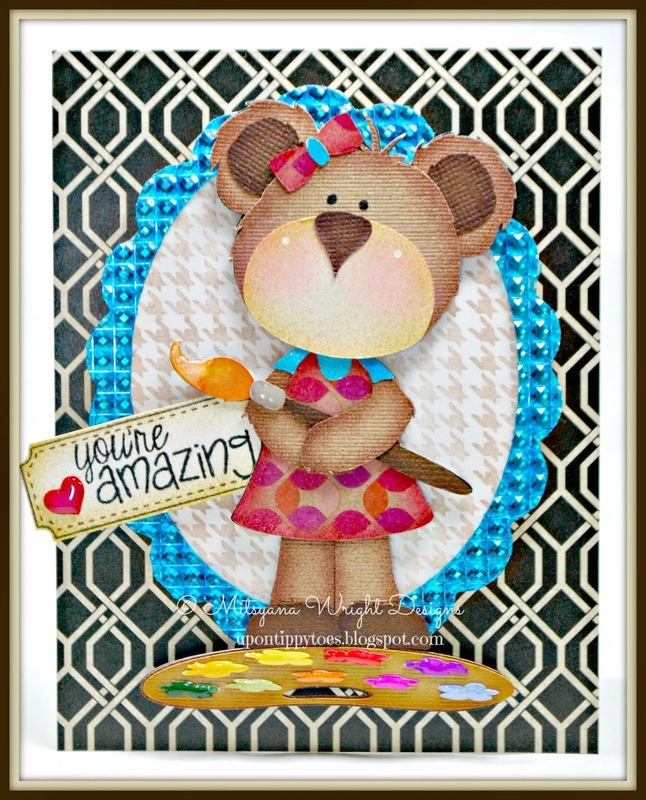 The "you're amazing" sentiment, ticket, and houndstooth background are all stamps from Pink and Main. Sentiment and houndstooth are from the "Mister" stamp set. And the stitched ticket stamp is from the "Stitched Greetings" stamp set. I stamped the houndstooth image in Versa Magic's Sahara Sand on white cardstock about 9 times. I was very careful to align them correctly so the pattern looked continuous... and since the stamps are made of clear polymer, alignment is a breeze! I also stamped my ticket and sentiment onto white cardstock, this time using Momento's Tuxedo Black. Then quickly cut it out with a pair of scissors and ebrushed the edges of my ticket so the white wasn't so stark. One of the reasons I love paper piecings is my ability to add tons of dimension on a whim. 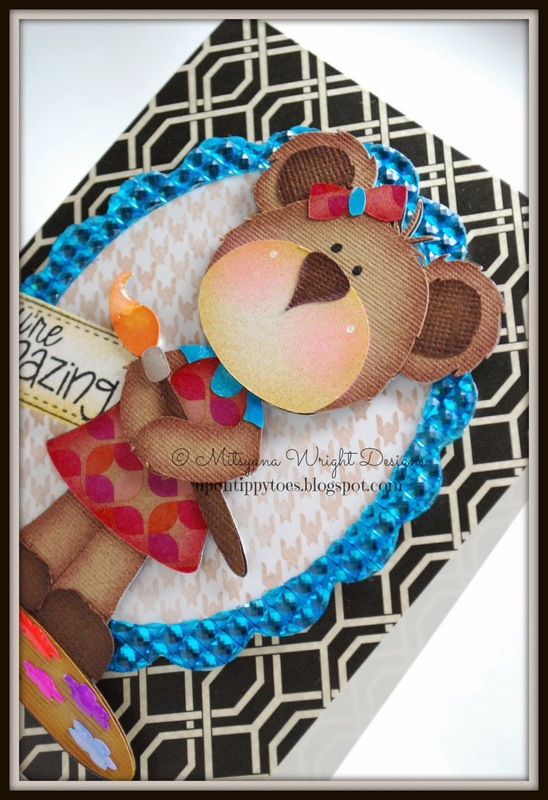 My cards are very rarely flat and a 3D card is absolute favorite too make! I want my cards to look and feel as though the images are reaching out at you! And here is my finished card. I hope I succeeded! Hope you all enjoyed today's project! Love it, you are very talented!